Located on NE Tillamook & Rodney, this Intersection Repair project began in 2010 under the name Inclusion Intersection Piazza and was ultimately created in 2013. The neighbors of southern Eliot have created an exuberant design with a lovely series of concentric circles and a luminous pink rose in the center. The floral center design represents growth and beauty in our community, which is located just north of the Rose Quarter. In the southern quadrant of the painting, musical notes remind us of our neighborhood’s vibrant jazz culture. The western quadrant features handprints of all those who come together to work on the painting. The northern quadrant represents the community gardens that have sprung up along our streets, as well as those we cultivate in our own yards. Finally, the eastern quadrant depicts the gears of the bicycles that flow through this intersection, which is the convergence of two greenways. The intention of the Eliot Community Crossing is twofold. Serving to encourage and create an opportunity to deepen neighborly relationships in our quickly densifying neighborhood. Also, intersection art naturally elicits a sense of pride and identity for all that pass through, speaking to Eliot’s urban model for integrating art, enhancing neighborly values and improving the quality of life in the neighborhood. 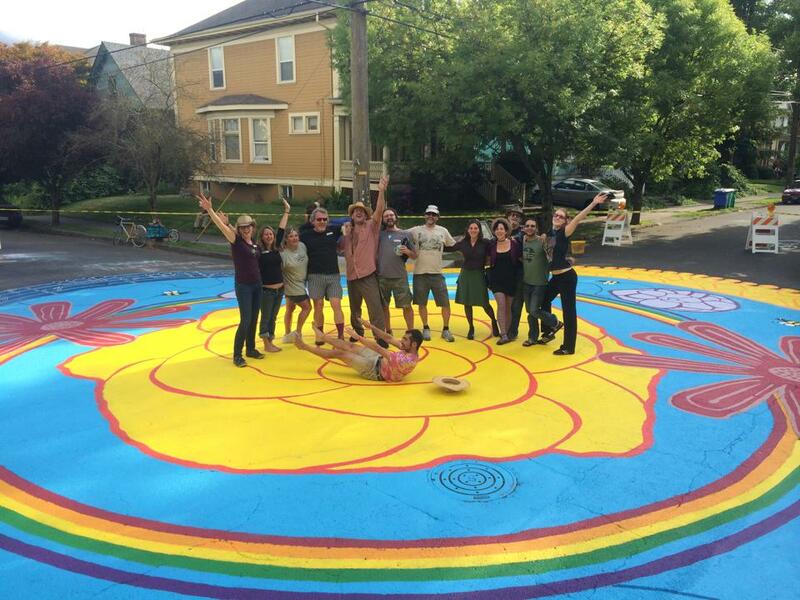 The Eliot neighborhood crossing painted intersection is one of the newest and growing recognizable landmarks in Eliot neighborhood. The annual repainting party tradition will keep our neighborhood looking bright and beautiful and brings neighbors together to celebrate our growing and diverse community.